How Smart Factories are Changing the Manufacturing Industry? "How Smart Factories are Changing the Manufacturing Industry?" Across the globe, the manufacturing industry has established agencies to regulate their own market. Today, manufacturers have a wealth of data coming in from operations and other functions which can be turned into a competitive advantage. Manufacturing companies- small and large alike, are also learning how to leverage the value, from sharing of contact lists and files, to streamlining their manufacturing processes. All the innovations are redefining the way manufacturing industries performed their business but are they really connected? 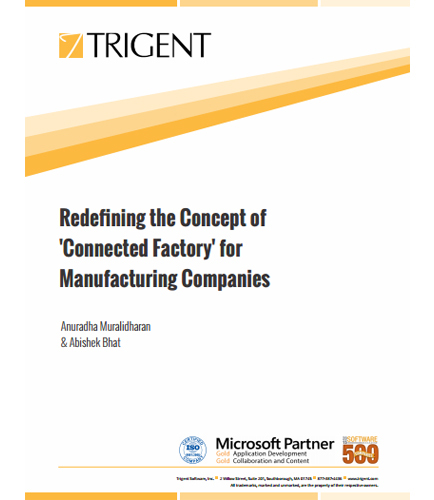 This whitepaper delves into the transformations that manufacturers can relate to, including overcoming inefficiencies, securing processes and intellectual properties, while reducing costs. What should manufacturing industries be mindful of as they plan for growth?